Smt. Anima Majumder a farm woman of Dandhugachh village of Chopra Block of Uttar Dinajpur district bagged the Best Farm Woman Award of India (National Level) i.e. “Mahindra Samridhi Award – 2019” for her contribution in the Mushroom cultivation sector and its value addition. Smt. Anima Majumder and her husband are marginal farmers having 1 acre land, due to which they had suffered a lot to earn their daily livelihood. It was very difficult for them to earn their daily bread and put up with expenses of their child’s education. In the mean of time Smt. Anima Majumder came in touch with Dr. Anjali Sharma, Subject Matter Specialist (Home Science) of Uttar Dinajpur Krishi Vigyan Kendra, Uttar Banga Krishi Viswavidyalaya, Chopra, Uttar Dinajpur. As per suggestion of Dr. Sharma, Smt. Anima Majumder started training on Mushroom cultivation. Within a few days her dedication and hard work reflected very well among the trainees and others. Then she was advised to take advanced training on Mushroom Spawn production in Krishi Vigyan Kendra’s Bio-input Laboratory. Along with that she started training on value addition of Mushroom like – preparation of Mushroom pickle, Mushroom added Daler Bori (Pulse chunk), Mushroom added Papad, etc. Then she made a Mushroom cultivation unit at her home with the technical help of Uttar Dinajpur Krishi Vigyan Kendra. Within few days with active support from her husband Smt. Anima Majumder was able to produce mass amount of raw Mushroom, Mushroom Pickle, Mushroom Daler Bori, Mushroom Papad which she sold in the adjoining market and Silliguri successfully. After one year of Mushroom cultivation practices it has been observed that her income generation from this sector has been raised up to Rupees 15,000.00 to 20,000.00/month excluding cultivation expenses. Like other years, this year also famous India Company Mahindra announced nomination of best farmers/farm women category those who have contributed major agricultural advancement in the Agriculture sector through Agriculture Universities, KVKs and other organizations working for Agricultural Development of India. This is a very recognized step is being taken by Mahindra Company to pay honour for the farming community of our country. Pursuant to their announcement, Uttar Dinajpur Krishi Vigyan Kendra sent the filled in nomination application form for Smt. Anima Majumder to get recognition of her work that she has taken in order to make an example of entrepreneurship development for the Mahindra Samridhi Award 2018-19. On 18th March, 2019 Mahindra Samridhi Award – 2019 ceremony has been organized at the Ashoka International Hotel in New Delhi, where India’s top Agricultural Scientists were appointed as jury member of the Award function. After several screening procedure Smt. Anima Majumder’s name has been selected as the best young Women Farmer at the Nation Level for her contribution in Mushroom cultivation, spawn production and value added Mushroom products. As a result she was awarded by a prize money of ₹ 2.11 lakh, Citation and a winner trophy memento. Mahindra company also provided their to and fro journey ticket for her all family members from her home to Delhi. In addition to that, Mahindra Company also sent to and fro journey ticket for Smt. 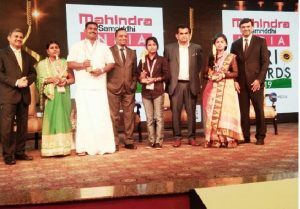 Majumder and her family from her home to Delhi to be present in the Mahindra Samridhi Award – 2019 ceremony who had won the same prize (prize money of ₹ 2.11 lakh, Citation and a winner trophy memento) for her significant contribution in the field of Mushroom cultivation in the form of Mahindra Samridhi Award – 2017-18 i.e., last year as an effort to make them more focus to do something new in the field of Agriculture and make them self sufficient in income generation.